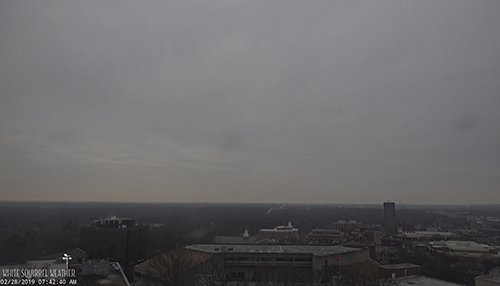 Welcome to Today@WKU, the daily newsletter from WKU Public Affairs, for February 28, 2019. WKU Student Night at Lost River Sessions LIVE March 16: WKU Public Broadcasting and Lost River Sessions LIVE will present an Evening with Parker Millsap on March 16 at the Capitol Arts Center in Bowling Green. As a part of this special event, the first 100 WKU students who present an ID will receive free admission to the concert courtesy of LRS sponsor Mike Simpson. Panhellenic, IFC councils recognized at leadership conferences: The WKU Panhellenic and IFC councils were recognized during their recent leadership conferences in Atlanta. Spring Break 2019 Parking and Transit: Intersession services will be in effect during Spring Break Week (March 4-8). More: Intersession Parking Map; Parking Lot Lighting during Spring Break. Baseball: Crosby's Stellar Start Leads WKU Over Visiting Racers: In his first career appearance on the Nick Denes Field mound, freshman Hunter Crosby pitched five innings and allowed only one run in WKU Baseball's 9-5 victory over Murray State on Wednesday evening. Next: WKU (6-2) travels to Pensacola, Fla., for the 2019 Cox Diamond Invitational Friday-Sunday, which includes neutral-site games against North Florida, Louisiana Monroe and Tennessee. Men’s basketball: Hilltoppers Travel to UAB for Final Bonus Play Road Game: WKU Hilltopper Basketball continues Bonus Play with its second straight road game at UAB at 6:30 CT tonight in Birmingham, Ala. The game will air on beIN SPORTS. The Hilltoppers began Bonus Play with a loss Saturday at league-leading Old Dominion. WKU (16-12, 9-6 C-USA) is tied for third in the conference standings. Former Arkansas QB Storey transferring to WKU: Arkansas quarterback Ty Storey went home for winter break and started thinking about his future. Storey announced Wednesday on Instagram and Twitter that he’ll spend a graduate transfer season in 2019 playing quarterback for WKU. High School Basketball: Boys’ Fourth Region Tournament. Diddle Arena. Semifinal games at 6 p.m. and 7:45 p.m. Contact Campus and Community Events, (270) 745-2497. 8:30 a.m.: Board of Regents Meeting. Martin Regents Room, Jody Richards Hall. Contact Bob Skipper, (270) 745-4295. 8:30 a.m.: Middle School Honors Band Clinic. Van Meter Hall. Contact Music, (270) 745-3751. 9 a.m.: SOKY Book Fest Used Book Sale. Warren County Public Library’s Bob Kirby Branch, 175 Iron Skillet Court. Through March 3. Contact Jennifer Wilson, (270) 745-6977. 9:30 a.m.: Mark of Excellence Awards. Jody Richards Hall Auditorium. Contact Sam Oldenburg, (270) 745-3055. 6 p.m.: US Bank Celebration of the Arts Opening Reception. Kentucky Museum. Contact Kentucky Museum, (270) 745-2592. 6 p.m.: Residence Halls Close for Spring Break. (Halls reopen at noon March 10.) Note: Barnes-Campbell, Hilltopper and Northeast halls remain open. Contact Housing, (270) 745-4359. 11 a.m.: Southern Kentucky Team Penning. L.D. Brown Agricultural Exposition Center. Contact Ag Expo Center, (270) 745-3976. 6 p.m.: High School Basketball: Boys’ Fourth Region Tournament Championship. Diddle Arena. Contact Campus and Community Events, (270) 745-2497.